17 June 2012: [Extension] Thinking about the small south extension: we will have a large triple glazed window, the sort that lets in more heat than it lets out, computed over a year - contributes to the heating. We will also need a shader and I am experimenting with metal structures. The one in the image rotates to be virtually invisible for winter and over cast conditions. A quick tweak of the shader angle, and it provides good shading for high summer sun. What is the purpose of the Solar PV panels? I cannot let the opportunity for a south roof to be lost, and Im eager to try a third way of charging the earth - using PVT, PV Thermal. 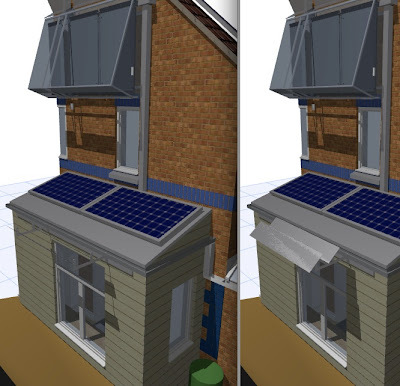 There's a duct in the design linking the roof of the extension to the inlet just below the existing sunbox - that can carry insulated pipes from the PV panels to the loft, and can be connected to the existing piping at that end. The PV would be used to charge a battery, from which we would run low wattage devices in the house - mainly the pumps in the loft, the energy meter, the printer, the broadband modem and the laptop. I have a 600watt inverter, so the total has to be below this figure. With liquid cooling, the PV capture in summer will be 15% higher than two equivalent panels would be.